The word “milk” in the above quote (Greek gala) means the basic, elemental teachings of Christianity first learned by new believers according to Vine’s Expository Dictionary of the Old and New Testaments. The word “meat” in 1Corinthians is from the Greek word “Broma”. Its’ Strong’s number is G1033. It means the deeper, more complete teachings of God’s Word. 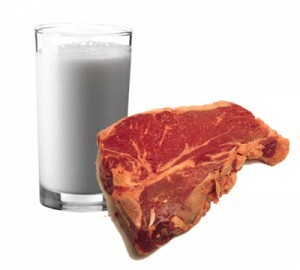 Paul contrasts the idea of spiritual “milk” and “meat” in his letter to the Hebrews. Hebrews 6:1-2 (KJV) – “Therefore leaving the principles of the doctrine of Christ, let us go on unto perfection; not laying again the foundation of repentance from dead works, and of faith toward God, Of the doctrine of baptisms, and of laying on of hands, and of resurrection of the dead, and of eternal judgment. In conclusion, if we use the Bible to interpret itself, the words “meat” and “strong meat” refer to deeper, more complex Christian teachings. However the word “milk” refers to the basics of Christian teaching. Interestingly, Peter uses part of this same metaphor when he writes to encourage scattered new believers. I don’t know about you, but I want all of the Word of God, both the milk and the meat. I want to rightly divide the Word of truth. I want the scriptures to reveal themselves to me. Prayer and systematic study are the keys to feasting on the “meat” of God’s Word. For more information on how to study the Bible refer to Rules for Understanding the Bible! Almighty God has revealed to me a divine dichotomy: in order to digest more of the fleshly “meat” of the Word, one must become more spiritual and less of the flesh !